Charisma Buan and Christian Jocson, Vivo brand executives, Annie Lim, Vivo brand director and Nelson Perez, Vivo digital specialist hand over proceeds from its Vivo Perfect Selfie Cup to Francis Hussein Mamasabulod, Habitat for Humanity partnership manager, and Rowena Kakilala, Habitat for Humanity individual giving manager. 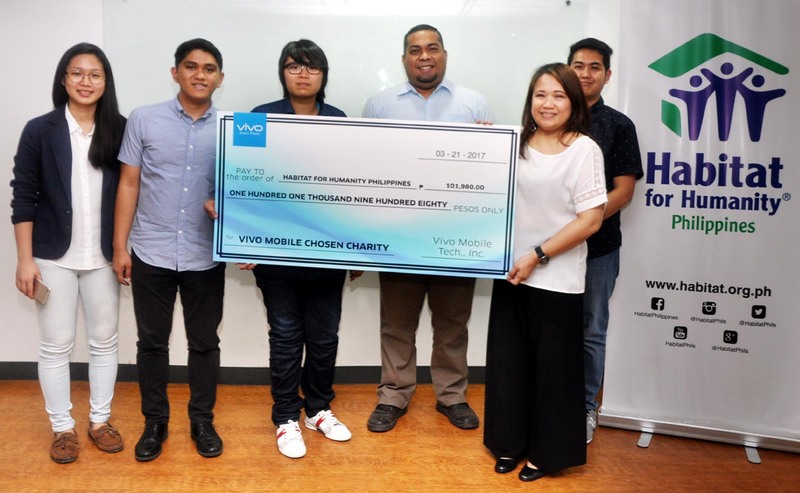 After the first ever #VivoPerfectSelfieCup, top five premium global smartphone brand Vivo 1 fulfilled its promise: donating all proceeds of the promo (a total of Php 101,980) Habitat for Humanity Philippines, a non-profit housing organization tacking poverty by building and renovating homes for families in need. Vivo brand director Annie Lim and Vivo brand executive Christian Jocson handed over the donation to Francis Hussein Mamasabulod, Habitat for Humanity Philippines partnership manager, and Rowena Kakilala, Habitat for Humanity Philippines individual giving manager last March 22 at the non-profit organization’s headquarters in Makati City. 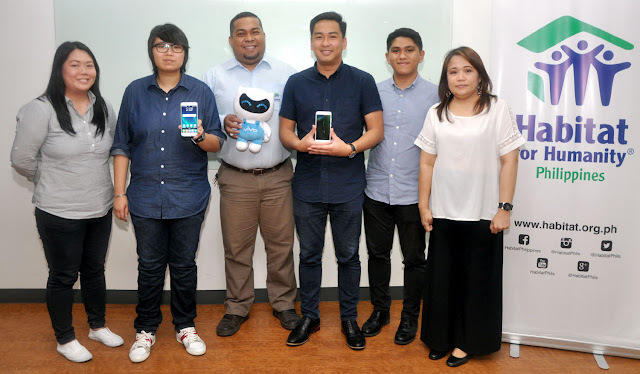 Also present in the event were Vivo brand executive Charisma Buan, Vivo digital specialist Nelson Perez, Habitat for Humanity Philippines individual giving officer Tricia Abrigo and Habitat for Humanity Philippines direct marketing officer Mateo Bautista. In the #VivoPerfectSelfieCup, celebrities battled it out with a goal of garnering the most number of likes for their perfect selfies. Selfies of Yeng Constantino, Erich Gonzales, Jessy Mendiola, Enchong Dee, Andrea Brillantes, Jane Oineza, Sue Ramirez, Miles Ocampo, Maris Racal, and Loisa Andallo were posted in the Vivo Philippines Instagram account (@vivophil), captured with the brand’s newest flagship phone, the V5 Plus, equipped with the world’s first 20-megapixel dual front camera and the most advanced selfie technology to date. (L-R) Tricia Abrigo, Habitat individual giving officer, Annie Lim, Vivo brand director, Francis Hussein Mamasabulod, Habitat for Humanity partnership manager, Mateo Bautista, Habitat for Humanity direct marketing officer, Christian Jocson, Vivo brand executive and Rowena Kakilala, Habitat for Humanity individual giving manager. These selfless stars asked netizens to like their selfies on the Vivo Instagram page (@vivophil), with every vote equivalent to a one peso donation to Habitat for Humanity Philippines. Teen star Andrea Brillantes emerged as the Vivo Perfect Selfie cup winner, with a total of 18,848 likes. Although only one star emerged as the triumphant #VivoPerfectSelfieCup victor, every like for each celebrity photo was converted into one peso, raising Php 101,980, all given to Habitat for Humanity Philippines. Annie Lim, Vivo Philippines brand director, expressed her gratitude to all the participants in the #VivoPerfectSelfieCup. “Vivo thanks everyone who joined our contest. Above all else, our brand always aims to help Filipinos have a better life and through participating, we gave hope to homeless families in the country,” she said. Aside from the donation to Habitat for Humanity Philippines, Vivo also awarded brand new Vivo V5 Plus phones to ten lucky likers. For inquiries about Vivo V5 Plus, visit the Vivo website at vivo.com/ph, or check out their Facebook (https://www.facebook.com/VivoPhil), Instagram (https://www.instagram.com/vivophil/) and Twitter (https://twitter.com/vivo_phil) accounts.